2016 | Adventure is out there! I discovered spoken word poetry -and Sarah- a few years ago and instantly fell in love with her poems. They speak the truth about human feelings, empowerment and even little things in life. One of my favorite poems of hers ever is this one. This makes me realize that men don't define you as a woman. If they can accept you with the way you define yourself as a woman, they're a keeper! you can let them look at you. But do not mistake eyes for hands or windows or mirrors. Let them see what a woman looks like. They may have not ever seen one before. you can let them touch you. Sometimes, it is not you they are reaching for. But their hands found you first. or a victim or a snack. You are a woman- skin and bones, veins and nerves, hair and sweat. You are not made out of metaphors, not apologies, not excuses. you can let them hold you. All day they practice keeping their bodies upright. Even after all this evolving it still feels unnatural. Still strains the muscle, hold firms the arms and spine. Some men will want to hold you like the answer. You are not the answer. You are not the problem. You are not the poem or the punch-line or the riddle or the joke. you can let them love you. Being loved is not the same thing as loving. It is realizing you have hands. If he leaves you with a car alarm heart, you learn to sing along. So forgive yourself for the decisions you've made. The ones you still call mistakes when you tuck them in at night. You have always been the place. You are a woman who can build it yourself. You are born to build. Hi i'm back in the kitchen! Or back to baking, to be precise. 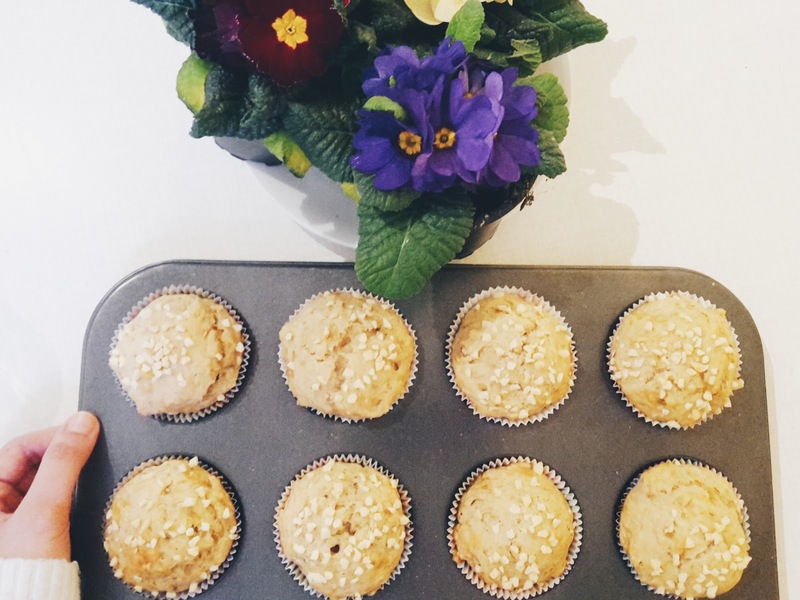 I've been looking for the perfect banana bread recipe but then I realized I don't have a loaf tin so I decided to bake the banana bread as muffins, hence: banana bread muffins. I wouldn't say it's the perfect recipe, but this one tastes surprisingly good, actually. Consindering that it's vegan, I'd say it's worth the try. I wanted to bake a non-vegan banana bread but then I realized (again) I don't have any eggs so I just tried the vegan version instead. Preheat oven to 200 degrees Celsius. Mix the flour, baking powder and cinnamon. In a separate bowl, mash the bananas and combine with the oil and sugar. Combine the wet and dry ingredients together, add your nuts or raisins. Put it in muffin tin about three-quarter full. Bake in oven for about 20-25 minutes or until a skewer comes out clean. Enjoy! I like to eat them with sunflower butter, it gives them nuttier flavor that I love. Happy baking!